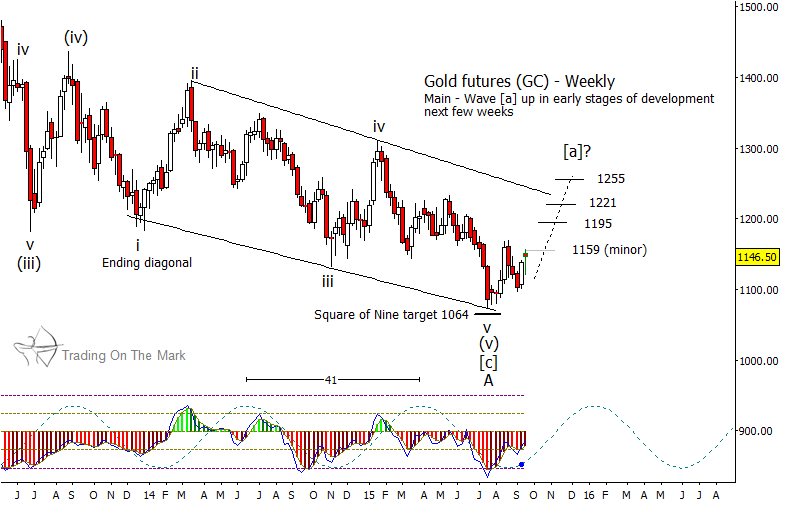 For gold traders, the trend is likely to be a fickle friend during the next year and possibly longer. Consider developing a relationship with volatility instead. When we last wrote about gold prices, we cautioned that the July decline was probably a false move – a "sucker play" that would trick many participants into taking short positions. Although we have revised our Elliott wave count since then, the scary upward trade from late July worked well. Price bounced from slightly above the Gann square-of-nine target we had identified at $1,067. Now we have additional price information to chart a path forward. The choppy decline that began early in 2013 appears to be complete, and its structure may offer a clearer picture of the entirety of the decline (so far) from 2011. We believe the overall decline to date has been a three-wave [a]-[b]-[c] move. Within that structure, wave [c] consisted of five waves, labeled (i)-(ii)-(iii)-(iv)-(v). The fifth and final wave of that sequence took the form of a downward, overlapping diagonal pattern, which has correctly reflected a market in which most participants believe price "should" go higher. The monthly chart below diagrams the structures we have described. Although we believe the market is ready for an upward reversal, we also believe the current period of deflation in relation to the U.S. Dollar is not over. In those conditions, precious metals probably will trade within a range. 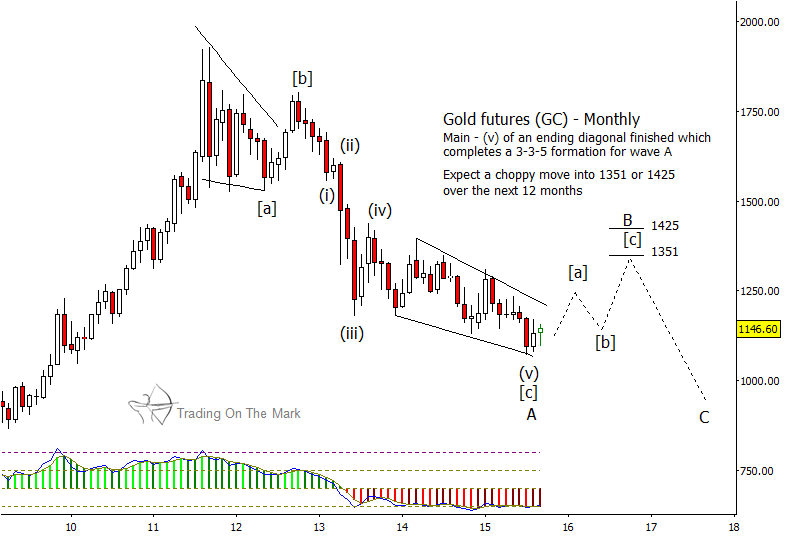 That is why we are provisionally treating the big three-wave decline in gold since 2011 as merely the first part – wave 'A' – of an even larger three-wave A-B-C correction. While the monthly chart above provides a sketch of what the remainder of the big correction might look like, the weekly chart below offers some more useful targets and timing for what might be the first upward leg in an overall sideways journey. The dominant 41-week cycle for gold has an ideal high near the end of 2015, which might present as the culmination of wave [a] of 'B'. Another decline and rise into the next cycle high might frame the rest of wave 'B' and show where downward wave 'C' can begin, late in 2016. Trading the pending 'B' wave and its internal components will be tricky. As a general strategy, traders should look for "base hits" from intermediate support or resistance levels, rather than looking for the "home run" of catching a lasting trend. A careful trader might be able to work from weekly charts, but traders using daily charts probably will be able to read the market better during the swings. Follow Trading On The Mark on Twitter and Facebook to receive timely market updates.